Dark flow is an astrophysical term describing a possible non-random component of the peculiar velocity of galaxy clusters. The actual measured velocity is the sum of the velocity predicted by Hubble's Law plus a small and unexplained (or dark) velocity flowing in a common direction. 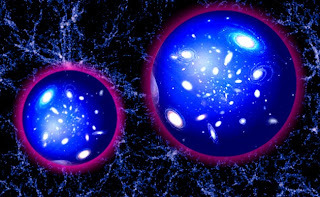 According to standard cosmological models, the motion of galaxy clusters with respect to the cosmic microwave background should be randomly distributed in all directions. However, analyzing the three-year WMAP data using the kinematic Sunyaev-Zel'dovich effect, the authors of the study found evidence of a "surprisingly coherent" 600–1000 km/s flow of clusters toward a 20-degree patch of sky between the constellations of Centaurus and Vela. 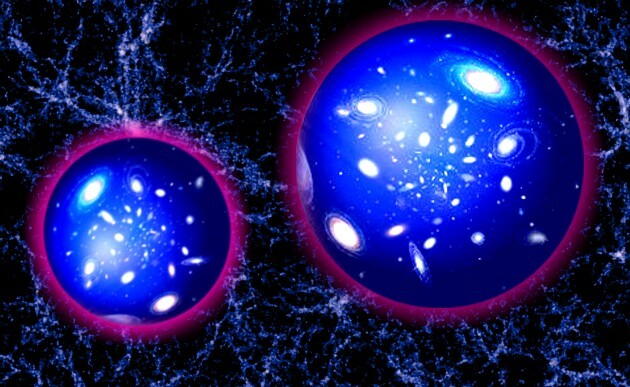 The authors, Alexander Kashlinsky, F. Atrio-Barandela, D. Kocevski and H. Ebeling, suggest that the motion may be a remnant of the influence of no-longer-visible regions of the universe prior to inflation. Telescopes cannot see events earlier than about 380,000 years after the Big Bang, when the universe became transparent (the Cosmic Microwave Background); this corresponds to the particle horizon at a distance of about 46 billion (4.6×1010) light years. Since the matter causing the net motion in this proposal is outside this range, it would in a certain sense be outside our visible universe; however, it would still be in our past light cone. The results appeared in the October 20, 2008, issue of Astrophysical Journal Letters. Since then, the authors have extended their analysis to additional clusters and the recently released WMAP five-year data. Distant galaxy clusters mysteriously stream at a million miles per hour along a path roughly centered on the southern constellations Centaurus and Hydra. A new study led by Alexander Kashlinsky at NASA's Goddard Space Flight Center in Greenbelt, Md., tracks this collective motion -- dubbed the "dark flow" -- to twice the distance originally reported. "This is not something we set out to find, but we cannot make it go away," Kashlinsky said. "Now we see that it persists to much greater distances -- as far as 2.5 billion light-years away." The new study appears in the March 20 issue of The Astrophysical Journal Letters. The clusters appear to be moving along a line extending from our solar system toward Centaurus/Hydra, but the direction of this motion is less certain. Evidence indicates that the clusters are headed outward along this path, away from Earth, but the team cannot yet rule out the opposite flow. "We detect motion along this axis, but right now our data cannot state as strongly as we'd like whether the clusters are coming or going," Kashlinsky said. 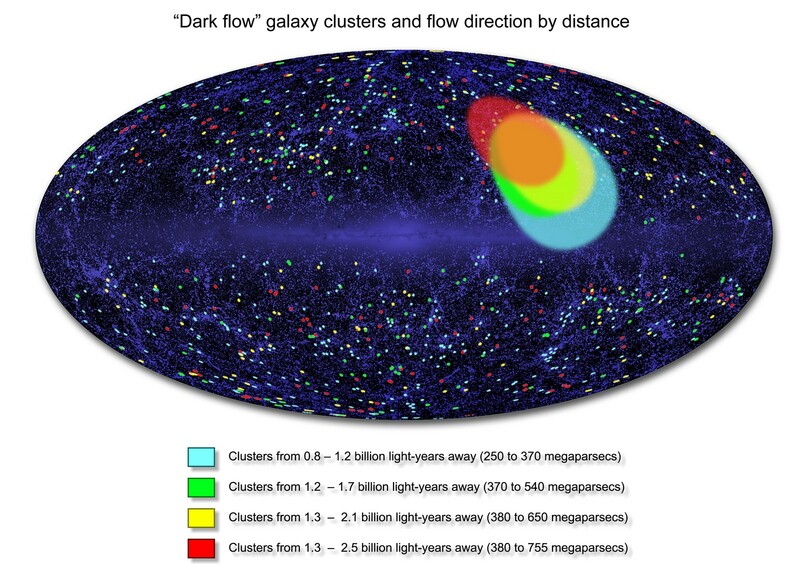 The dark flow is controversial because the distribution of matter in the observed universe cannot account for it. Its existence suggests that some structure beyond the visible universe -- outside our "horizon" -- is pulling on matter in our vicinity. Cosmologists regard the microwave background -- a flash of light emitted 380,000 years after the universe formed -- as the ultimate cosmic reference frame. Relative to it, all large-scale motion should show no preferred direction. The hot X-ray-emitting gas within a galaxy cluster scatters photons from the cosmic microwave background (CMB). Because galaxy clusters don't precisely follow the expansion of space, the wavelengths of scattered photons change in a way that reflects each cluster's individual motion. This results in a minute shift of the microwave background's temperature in the cluster's direction. The change, which astronomers call the kinematic Sunyaev-Zel'dovich (KSZ) effect, is so small that it has never been observed in a single galaxy cluster. In 2008, armed with a catalog of 700 clusters assembled by Harald Ebeling at the University of Hawaii and Dale Kocevski, now at the University of California, Santa Cruz, the researchers applied the technique to the three-year WMAP data release. That's when the mystery motion first came to light. "It takes, on average, about an hour of telescope time to measure the distance to each cluster we work with, not to mention the years required to find these systems in the first place," Ebeling said. "This is a project requiring considerable followthrough." According to Atrio-Barandela, who has focused on understanding the possible errors in the team's analysis, the new study provides much stronger evidence that the dark flow is real. For example, the brightest clusters at X-ray wavelengths hold the greatest amount of hot gas to distort CMB photons. "When processed, these same clusters also display the strongest KSZ signature -- unlikely if the dark flow were merely a statistical fluke," he said. In addition, the team, which now also includes Alastair Edge at the University of Durham, England, sorted the cluster catalog into four "slices" representing different distance ranges. They then examined the preferred flow direction for the clusters within each slice. While the size and exact position of this direction display some variation, the overall trends among the slices exhibit remarkable agreement. Future plans call for testing the findings against newer data released from the WMAP project and the European Space Agency's Planck mission, which is also currently mapping the microwave background.